How To Score Better In Olympiad Exams? To score better rank in “Olympiad Exams”, it is important to use your Olympiad Helper Subscription properly. Please follow, below steps to get most out of your "The Most Trusted and Comprehensive Olympiad Exam Diagnostic and Preparation Tool"
Once you are a valid subscriber, you will have a username and password. Visit https://test.olympiadhelper.com and use your username and password to log in. After successful login, you will be able to view your dashboard. Don't wait! Start Learning and Conquering all by yourself using our to-the-point training videos. It does not matter; whether you are a slow learner or fast. Our self-paced eLearning courses are designed in such a way that it matches with your speed and knowledge. eLearning courses include hundreds of videos / quizzes / presentation designed to support your learning initiatives by focusing on both interactivity and expert instruction. We combined the knowledge of our subject matter experts with sophisticated development tools and techniques to create interactive self-paced content that provides flexibility and engaging content for your better understanding. Currently eLearning Courses are available for Science and Mathematics. Once you complete studying a chapter (either in school or by yourself), fi nd it in the chapter list provided and generate a test by selecting only that chapter. It will generate a question paper containing ten questions from the selected chapter only. Attempt the test and evaluate your preparation. In case, you have not scored satisfactorily in the test, revise the chapter and generate a new test for the same chapter. Once you complete studying of next chapter, follow the step one for the second chapter. Once you are comfortable in the second chapter, please create a test by selecting both the chapters. This will give you a test with questions from both the chapters. Remember, you can generate a chapter wise test by selecting minimum one chapter and maximum fi ve chapters. You can follow the above steps for all the chapters. Once you are comfortable with the syllabus, you can attempt sample tests, in which questions will be asked from the entire syllabus for selected exam pattern. There is a link to send feedback/doubts about the question at the bottom of each question. In case you are not satisf ied with the question/answer or answer description, you can communicate the same to us, using this link. Our team will get back to you with explanation / solution / details within 48 hrs. 7. What to review the question with teacher / parent? "Mark Question for Review", this checkbox is located above each question. If you have doubts in a question and want to discuss with your parent/teacher, then make the question for review. All the questions which are marked for review are listed separately in the summary box. 8. Should you revisit Chapter-wise tests? After completing few sample tests, with the help of our detailed strength and weakness report, you will be able to identify, your weak areas. We strongly recommend, to revise those chapters again and evaluate yourself using chapter-wise test. After completing few sample test, you should be confi dent about the syllabus, exam pattern and marking scheme. This is the correct time to attempt your first mock test. At the end of your mock test, you will be able to get your percentile performance across all the students appeared in the same test. This will give you an idea, about your preparation against your competitors. Ideally, you should attempt your first mock test after completing 7th sample test, second mock test after 15th sample test and 3rd mock test after 20th sample test. During the preparation, it is advisable to generate review test after each 5th sample tests. 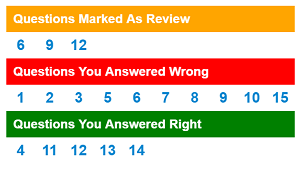 Review test will provide you with a test containing all the questions you have marked wrong. Each review test will include a maximum of 25 questions. Note: Please f inish all created review tests before creating a new one. Otherwise, you will see same questions in all the review tests. Once you are done with all the assigned quota of questions papers including other exam patterns, use "Reset Test" feature to re-appear in the tests. Remambar, you can't reappear in Mock Tests. 12. "Time Tracking" and "User-Notes"
Note you also have "Time Tracking" and "User Notes" facility to help you prepare yourself for "D-day".